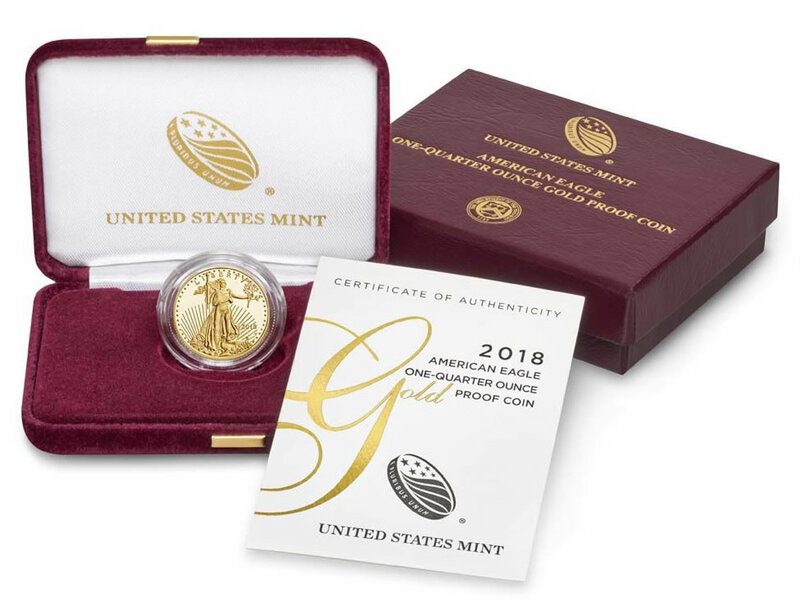 Early United States Mint sales figures are now available for the new 2018-W Proof American Gold Eagles. Released last Thursday at prices ranging from $187.50 to $3,107.50, collectors snapped up a combined 16,363 coins for one of the lower starting totals in recent years. American Gold Eagles are produced in sizes of 1 oz., 1/2 oz., 1/4 oz. and 1/10 oz. with respective denominations of $50, $25, $10 and $5. As is often the case, the set with one of each size was the biggest unit seller. The U.S. Mint published sales data for 281 numismatic products. Thirty-one products outperformed their prior weekly gains against 50 previously. Not counting the new products so as to compare apples-to-apples, 4 products increased by more than 1,000 units compared to 2 previously. In addition, 5 products saw their sales totals reduced against 6 previously. All of them included revisions to the now no longer available WWI Centennial Silver Dollar and Medal Sets. Below are tables showing the latest sales for U.S. Mint numismatic products. The sales period covers Feb. 26 to March 4. Products with an asterisk (*) are no longer available or had no reported sales. kinda interesting how they have mintage limits on these now, isnt that a deviation from previous years? On the U.S. Mint’s website those individual gold coin items are each listed with a Product Limit and NOT a Mintage Limit. I’m familiar with coins that have Mintage Limits AND Product Limits, and coins that have Mintage Limits but NO Product Limits, but I’m not sure what it means when a coin is listed WITH a Product Limit but WITHOUT a Mintage Limit. Exactly how does that work? You are right on point on the GAE Proof coins. The Mint is picking numbers out of thin air & it is not really relevant since most of these coins will not sell out at those numbers. By my calculations, the total mintage for each of the coins – individual product plus those in the set – works out as follows: 1 oz. – 43,000; 1/2 oz. – 25,100; 1/4 oz. – 43,000; 1/10 oz. – 40,000. From this one might conclude that the half ounce version will be the “key weight”. It is also interesting that the bullion version AGE 1/2 ounce $25 gold coin sold directly to the Mint’s 12 bullion coin Authorized Purchasers is almost always the lowest seller by mintage each year. Don’t know why collectors do not care much for the gold half-ounce size in either version!? Seth – I tend to stick to 1 oz – 1/4 or 1/10 ounce bullion gold. I do have a few 1/2 ounce gold but only bought at spot back in the day. Its all about price point for me. Either i’m all in for an ounce or I throw in a fractional gold with my silver purchase. So much choice for fractional gold BU below a half oz. So much for my “key weight” supposition regarding the half ounce AGE! Now I’m really glad I just meant that as a play on words for “key date”…whew.